Ontario’s buzz lasts all times of year, from the pristine snow in winter, to the wonderful warmth of summer. Experience the energy of Toronto, the charm of Ottawa and the quintessential Canadian wilderness of Algonquin. Fascinating landscapes await across the province, not least at the roaring Niagara Falls. The exciting hub of Toronto thrives by day and night. Visit the many attractions, galleries and museums by day, and dig into the foodie hotspots by night. A treasure trove of local and international delicacies can be found in the St Lawrence Market and the Distillery Historic District features a mix of mouth-watering delights. No trip to Toronto is complete without a visit to the CN Tower, and an EdgeWalk for the bravest. The thundering Niagara Falls region invites you to explore the natural wonder by air, land or water. Take a breath-taking boat tour with Hornblower Niagara Cruises or take in sweeping views of the Falls from above on Niagara Helicopters. Get a different view at Journey Behind the Falls or from the MistRrider Zipline to the Falls. Be exhilarated aboard a Whirlpool Jet Boat tour through the whitewaters of Devil’s Hole Rapids – there are wet and dry options! Quaint towns and adventures off the beaten path lie scattered province-wide. From the lakes of Muskoka, to the vast pristine landscapes of Algonquin Provincial Park and the 1000 Islands. Read on to find further reasons to visit Ontario's three most popular locations: Niagara Falls, Toronto and Ottawa. Without a doubt the waterfalls which straddle Canada and America are one of the world's most famous and impressive natural landmarks. Horseshoe, American and Bridal Veil falls are all well-worth your camera's memory card and no trip is complete without donning a plastic poncho and embarking on a boat tour on-board the Maid of the Mist. What to see: The falls are obviously worth your attention although there's an aquarium, fort, art park and adventure theatre to further illuminate your visit. Views from Goat Island, Skylon Tower and the Cave of the Winds are well-worth experiencing and if you've got the cash then splashing out on a helicopter ride is always something to tell the grand-kids about. What to do: There are several hiking trails and picnic areas in Niagara Falls State Park and Queen Victoria Park which present plenty of ideas for a summer's day whilst boat tours, board-walks and a cable car ride are all great for getting closer to the white water action. A marine theme park, botanical gardens and a Ripley's Believe it or Not Museum offer several more things to do although, if you get carried away in the moment, you can always get married with little or no waiting period. Where to stay: Niagara Falls City has quickly become an entertainment capital and a great place to stay even if you're only interested in watching the thundering waterfalls. Thanks to hotels, such as the Fallsview Plaza, offering a city centre location as well as views of Horseshoe Falls and the Niagara River, it means that you get to have your cake and eat it with loads of nearby theme restaurants and cafés (Hard Rock and Planet Hollywood) to further satisfy your hunger. More information and to book: One of the most well-known landmarks and destinations in the world, Niagara Falls is a sight to behold. Located in the south of Ontario on the shore of the lake bearing the same name, Toronto is a bustling commercial hub and often cited as one of the world's most liveable cities. Skyscrapers and Victorian architecture compete for space and a wide range of multi-cultural districts offer an eclectic mix of restaurants, bars and urban hang-outs. 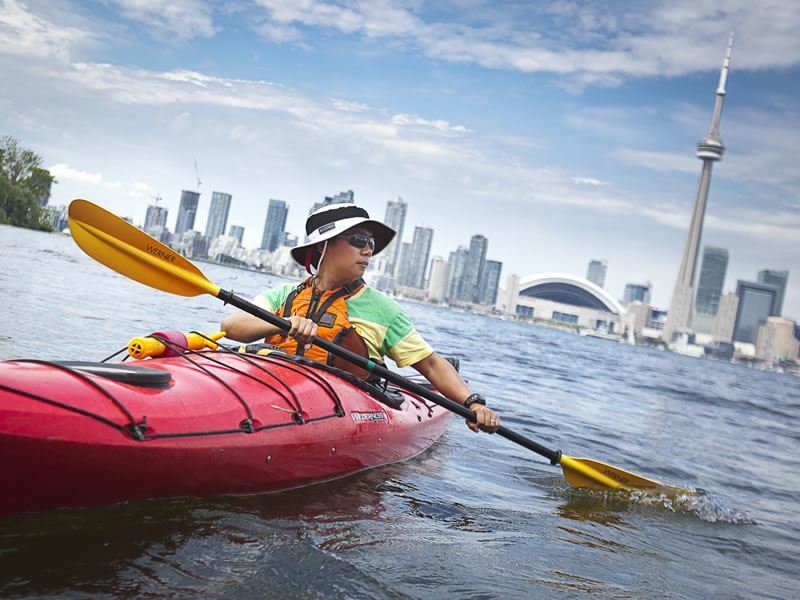 What to see: Definitely head to Lake Ontario as there's around 30 miles of shoreline from where to look wistfully over the water or watch the world float by across Toronto Bay. If you do find yourself harbour side then it would be rude not to take a day trip to the islands as this promises a car-free experience as well as numerous beaches and further waterways from where to cool down on a hot and humid summer's day. What to do: You've got to go to Kensington Market as this is not only one of Canada's National Historic Sites it's also considered to be Toronto's most photographed neighbourhoods with no end of stalls, cafés and street performances making it ideal for at least a Sunday morning stroll. Where to stay: If you've got plans to make a base in the city then the Fairmont Royal York Hotel is a great choice as it's slap bang in the centre of town and just a stone's throw away from the likes of the Royal Ontario Museum, the Eaton Centre and Toronto Harbour. Canada's capital is just an amazing city and ranks up there with the best of them when it comes to cleanliness and picture perfect skylines. Thanks to several restrictions placed on new structures, important sites, including: the Peace Tower and Parliament Hill, can be seen no matter where you are with views from the Ottawa River and the Alexander Bridge always promising an awesome photo op. What to see: ByWard Market in the Lower Town neighbourhood is now in its fifth form after previous versions being destroyed by fire however, as Canada's oldest working farmers' market it's still worth a visit, especially if you're hunting for fresh goodies to add to a picnic basket. What to do: Take a river boat ride, as not only will you get to see sights, such as: the Fairmont Château, the National Gallery and the towers of the downtown district but you'll also get to go on the Rideau Canal which is the oldest of its kind in the whole of North America. Where to stay: Staying in Canada's capital gives you much more time to explore and enjoy the city sights and basing yourself in the Fairmont Château Laurier means that you'll be stepping out in some style. Situated adjacent to the Parliament buildings and existing as an awesome example of architecture in its own right, the Fairmont is all about the elegance and well-worth checking out if you're looking for something a little bit special.